As your dauntless adventurous reporter I visit many an establishment, some which are on my personal list of must-go-to places, others bold new journeys into the unknown. And why do I take these daring plunges? Because I’ve taken it upon myself to both laud the good and damn the bad, thereby sparing The Kosher Scene‘s readers the experience of wasting good money on a bad meal, recommending with eclat the good, noteworthy spots. 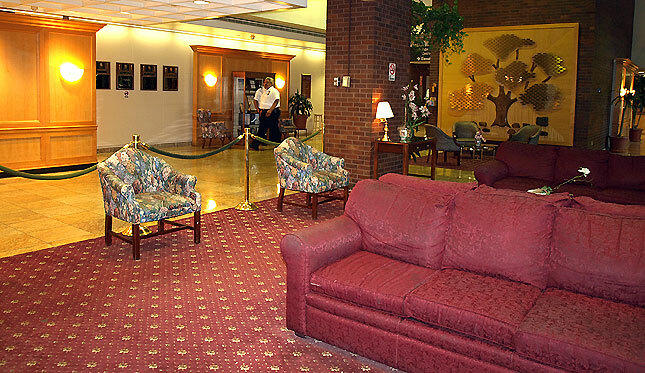 This past Shabbat, I found myself in a turn of events I could never have anticipated… Imagine a beautiful, tastefully decorated hotel-like lobby complete with gift shop and concierge.service, well sort of. Neither hotel, nor restaurant, this was one place I would never have wanted to stay at… let alone eat at. But, that’s where I reluctantly spent last Friday through Monday. And… it saved my life! As a result of an acute allergic reaction SYR rushed me to Brooklyn’s New York Methodist Hospital, shortly before 9:00am last Friday, looking like a not so distant relative of the bubonic plague survivor or a Brobdingnagian Monster who escaped from the volcanic vortex of Mount Vesuvius.. . By mid afternoon I was admitted to the hospital while I was gawked at and prodded like a curious museum exhibit, by a whole parade of doctors, wanna- be doctors and other curious onlookers and tourists who came to admire my unique and unsightly skin condition , tssk, shake their heads and walk away in deep contemplation… Frankly, I was scared… doctors were not quite sure what had happened or why! Their speculative diagnoses was somewhere between a geriatric version of killer chicken pox or a horrible allergic reaction, but… to what?!?!? Theories were rampant! Was it the cheeses I had been eating non-stop for the past three weeks, was it the detergents, had I come into contact with some contaminant or been bitten by some rabid tick or worse.? Had I come into contact with any strange woodland creatures, had I come into contact with any cute domestic creatures that weren’t quite kosher or clean? Don’t ask, it was humiliating if it weren’t so darn itchy and uncomfortable. There were the blood tests, the IV’s, the poking ad prodding till I resembled the Swiss cheese I thought I might be alllergic to. SYR, goodness personified that she is, would not leave me alone for Shabbat. She went to the well stocked Bikur Cholim room to drum up some food and she returned with all types of goodies including a very good, very moist sponge cake (I’m not normally a sponge cake fan!). The kosher food at dinner came from Palace Caterers, under the Volover Rav’s hasgacha. The next day, the Bikur Cholim‘s little pot of tchulent proved surprisingly tasty even if the color and consistency did not seem very promising. Day by day, thanks to the dedicated care of the hospital staff and the various visitors (family and friends!) my condition kept on improving until they finally discharged me on Monday afternoon. Today they gave me the results of the biopsy they run on Sunday and I’m happy to say that the allergy is not food related, at all!! So The Kosher Scene‘s important quest for the best will continue, Baruch Hashem! !